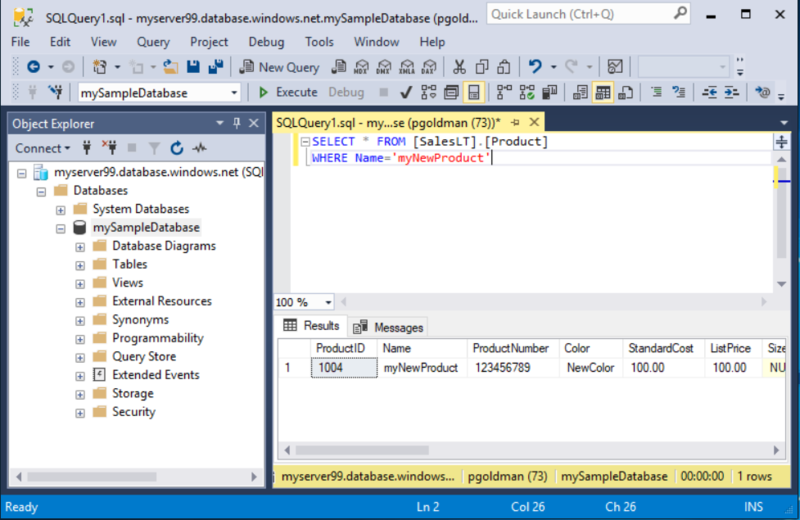 In this quickstart, you'll use SQL Server Management Studio (SSMS) to connect to an Azure SQL database. You'll then run Transact-SQL statements to query, insert, update, and delete data. 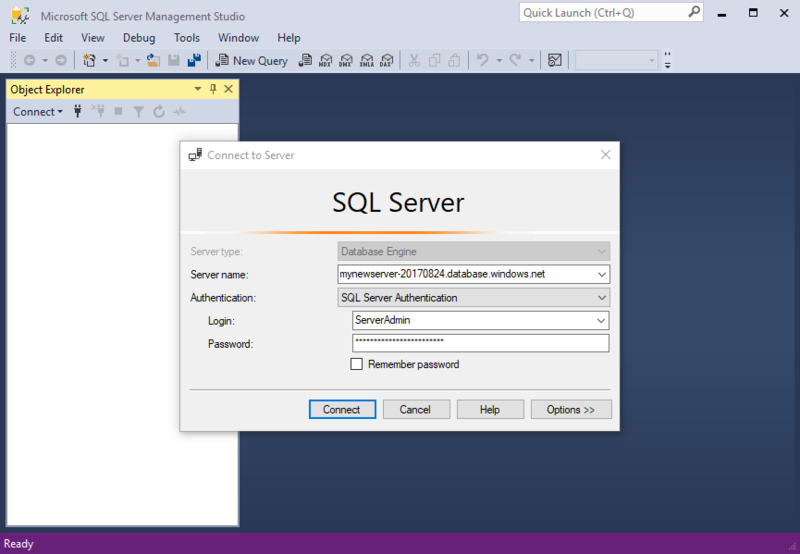 You can use SSMS to manage any SQL infrastructure, from SQL Server to SQL Database for Microsoft Windows. Before you start, make sure you've installed the latest SSMS. In SMSS, connect to your Azure SQL Database server. An Azure SQL Database server listens on port 1433. To connect to a SQL Database server from behind a corporate firewall, the firewall must have this port open. Open SSMS. The Connect to Server dialog box appears. Server type Database engine Required value. Server name The fully qualified server name Something like: mynewserver20170313.database.windows.net. 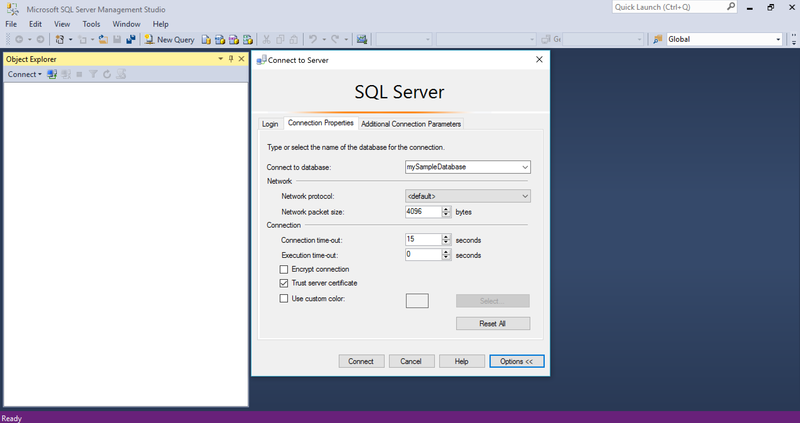 Authentication SQL Server Authentication This tutorial uses SQL Authentication. Login Server admin account user ID The user ID from the server admin account used to create the server. Password Server admin account password The password from the server admin account used to create the server. Select Options in the Connect to Server dialog box. In the Connect to database drop-down menu, select mySampleDatabase. Select Connect. The Object Explorer window opens. To view the database's objects, expand Databases and then expand mySampleDatabase. Run this SELECT Transact-SQL code to query for the top 20 products by category. 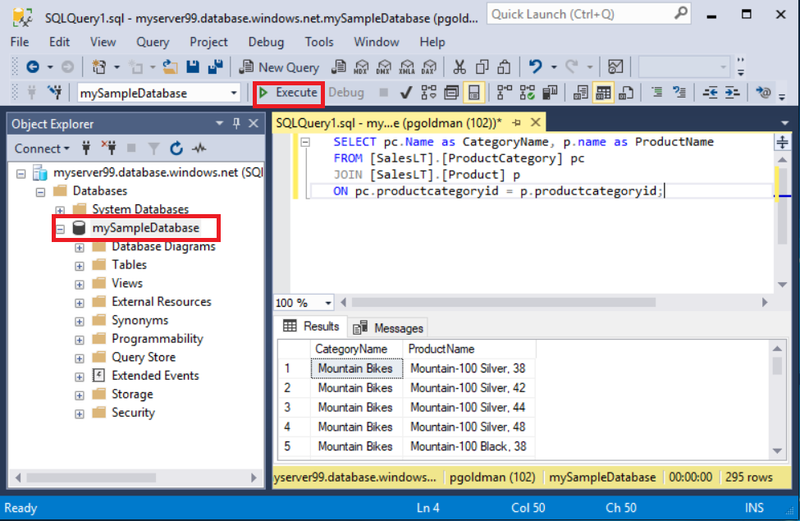 In Object Explorer, right-click mySampleDatabase and select New Query. A new query window connected to your database opens. In the query window, paste this SQL query. On the toolbar, select Execute to retrieve data from the Product and ProductCategory tables. Run this INSERT Transact-SQL code to create a new product in the SalesLT.Product table. Replace the previous query with this one. Select Execute to insert a new row in the Product table. The Messages pane displays (1 row affected). Select Execute. The following result appears. Run this UPDATE Transact-SQL code to modify your new product. Select Execute to update the specified row in the Product table. The Messages pane displays (1 row affected). Run this DELETE Transact-SQL code to remove your new product. Select Execute to delete the specified row in the Product table. The Messages pane displays (1 row affected). 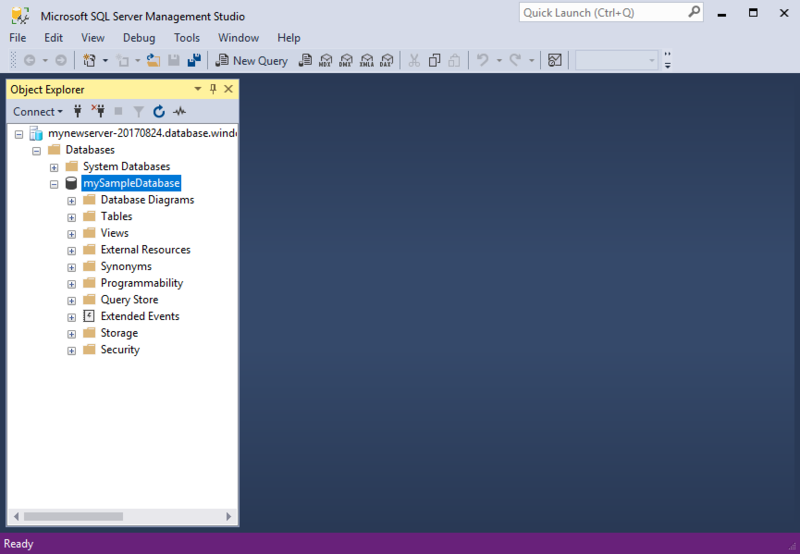 For information about SSMS, see SQL Server Management Studio. To connect and query using the Azure portal, see Connect and query with the Azure portal SQL Query editor. To connect and query using Visual Studio Code, see Connect and query with Visual Studio Code. To connect and query using .NET, see Connect and query with .NET. To connect and query using PHP, see Connect and query with PHP. To connect and query using Node.js, see Connect and query with Node.js. To connect and query using Java, see Connect and query with Java. To connect and query using Python, see Connect and query with Python. To connect and query using Ruby, see Connect and query with Ruby.